PandaTip: This performance contract template is designed to protect both the venue and entertainer during the whole contract management process. The template’s terms are designed to be easy to understand and fair to both parties. 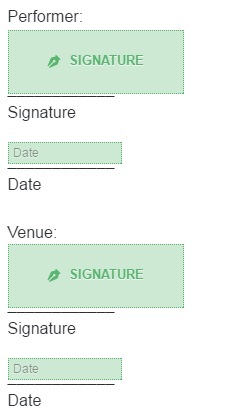 This Performance Contract, entered into on [Contract.CreatedDate] between [Performer.Name] (Performer) and [Venue.Name] (Venue). Beginning on the agreed date, the Performer will provide entertainment services for the Venue for a period of [Contract.Weeks] Weeks. Both parties agree to abide by the following terms and conditions during the term of this contract. The Performer will provide services on the following dates and times. PandaTip: Use the template’s performance table (above) to list all dates that the entertainer will be expected to perform at the venue. Be sure to list dates and times for all performances. The Performer agrees to arrive at the venue no later than 3 hours before the above listed times for setup and rehearsal. The Performer agrees to provide all on-stage equipment necessary to enable their performance. The Venue will provide the necessary space including dressing areas for the Performer to use during the term of this performance contract. PandaTip: The performance section of this template outlines the responsibilities of each party as they relate to the performances themselves. The performer agrees to provide equipment, such as speakers, amps, and props. PandaTip: Use the table below to list any payments being made to the performer, including deposits, retainers, and any other compensation. The Vendor will be responsible for the payments listed below upon each show’s conclusion. All payments listed below are inclusive of service costs as well as taxes and applicable fees. PandaTip: This section of the performance contract template makes it clear that neither party can cancel this contract without good reason. The Performer may not cancel this performance contract without due cause, such as failure by the Venue to uphold the entire scope of this contract or make timely payment as listed above. Likewise, the Venue may not cancel this performance contract unless the Performer is found to have violated this contract. This contract shall automatically terminate upon the completion of services unless prior contract has been made between the parties. PandaTip: As a contracted entertainer, the performer is not considered an employee. The template’s terms make it clear that the entertainer is not entitled to employment benefits. Both parties are in understanding this performance contract does not serve in any way as an entry into employment between the Vendor and the Performer. The Performer shall remain an independent contractor and will be responsible for all applicable taxes and state fees as such. Any disputes related to this performance contract shall be resolved to mutual benefit through good-faith negotiation. Should the Performer and Venue find themselves unable to reach a resolution to a dispute, both parties agree to seek a binding ruling from a neutral arbitrator. PandaTip: This section of the template officially voids any agreements or promises that are not documented within the performance contract itself. This Performance Contract shall for all considerations be the entire agreement between the Parties. This contract shall supercede any and all written and verbal agreements that have taken place prior to the listed contract date. Any and all modifications or amendments to this contract shall be submitted in written form to the parties and will require both parties’ signatures prior to the changes taking place. PandaTip: This section of the template lists the means and destinations for any official communications related to this performance contract. PandaTip: This performance contract template can be e-signed by the Performer and Venue. PandaDoc signatures are legally binding. By signing below both parties agree to all terms and conditions included in this contract. Furthermore the parties acknowledge the receipt and understanding of this performance contract.